Stop speaking negative things into your life,the power of life and death is in your tongue , so from today start speaking prosperity and good health into your life. “Not what goes into the mouth defiles a man; but what comes out of the mouth, this defiles a man.”(Matthew 15:11 NKJV). “Let no corrupt word proceed out of your mouth, but what is good for necessary edification, that it may impart grace to the hearers”. (Ephesians 4:29 NKJV). “But no man can tame the tongue. It is an unruly evil, full of deadly poison. With it we bless our God and Father, and with it we curse men, who have been made in the similitude of God. Out of the same mouth proceed blessing and cursing. My brethren, these things ought not to be so. Does a spring send forth fresh water and bitter from the same opening? “(James 3:8‭-‬11 NKJV). 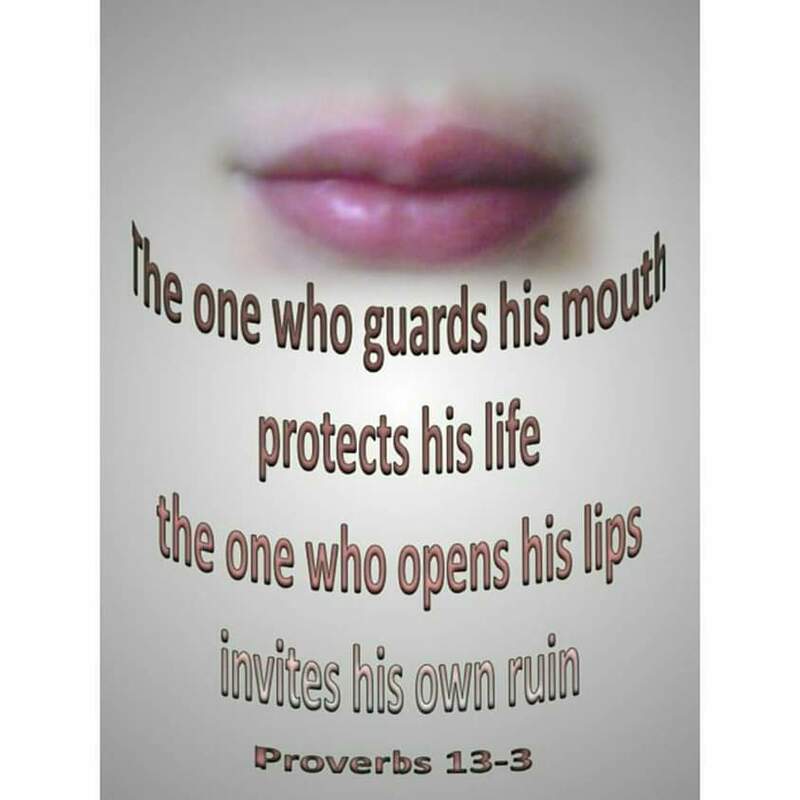 “For “He who would love life And see good days, Let him refrain his tongue from evil, And his lips from speaking deceit. Let him turn away from evil and do good; Let him seek peace and pursue it. For the eyes of the Lord are on the righteous, And His ears are open to their prayers; But the face of the Lord is against those who do evil.”(1 Peter 3:10‭-‬12 NKJV). “Let your speech always be with grace, seasoned with salt, that you may know how you ought to answer each one”. (Colossians 4:6 NKJV). “A wholesome tongue is a tree of life, But perverseness in it breaks the spirit. A fool despises his father’s instruction, But he who receives correction is prudent. In the house of the righteous there is much treasure, But in the revenue of the wicked is trouble. The lips of the wise disperse knowledge, But the heart of the fool does not do so”. (Proverbs 15:4-7). We must be careful with the words that we speak we are destroying our own lives with the words we speak. We are so set on speaking words of death that we can not accept words of life. For by your WORDS you shall be JUSTIFIED, and by your WORDS you shall be CONDEMNED. +The words we speak must be the WORD of God. +Therefore we must learn the Word of God (by study)so we can speak the WORD in accordance to every situation or circumstance. +The WORD of God is the LANGUAGE of God, and we must speak it ACCURATELY and FLUENTLY. This entry was posted in Daily Message and tagged speak financial prosperity into your life, speak healing into your life, speak the word of God into your life.